Because if it ain't old, it ain't gold. Mr Fogg and his gravity-defying penny-farthing bicycles would tell you as much. I would like to include in this post Regimental Vintage at 16 Cheshire Street, London E2 but as you've probably learnt from my previous heartbreak-of-a-blog post that's not going to happen anytime soon. Permit me to quickly take to the soapbox to thank you all for your overwhelming support - your outpour of positivity, words of kindness, and advice in this darkest of times has reminded me of how lucky I am to be loved by so many, and for that Henry and I thank you from the bottom of our healing hearts. It's been a horrible week - I've been left stunned, depressed, and outright sick from all of this. I refuse to let this affect my blogging (as disappointed as I am, I can't very well let you all down not when you've all been so supportive of my dream) so back to regular programming it is. I got the idea for this blog post from last Monday's evening with Mr Fogg & The Great Antiques Expert at the fictional Phileas Fogg's Mayfair home at 15 Bruton Lane. Henry had never been round to Mr Fogg's - surprisingly for an intrepid adventurer and serial collector - so I brought him to 15 Bruton Lane to show him why this cocktail bar in Mayfair, a recreation of Jules Verne's most well-loved gadabout's Victorian home is the perfect marriage of old-world charm and fiction brought to life with a living cabinet of curiosities. Guests were invited to bring something from home to be evaluated by David Harper, antiques expert and TV personality known from BBC series The Antiques Road Trip, Flog It and Bargain Hunt. Henry and I were just a little disappointed (as were Mr. Harper and those present, I'm sure) that we missed the opportunity to bring in our latest acquisition - a World War II Royal Navy officer's bicorn hat by Gieves worn by Commander Charles Fraser Harrington Churchill. Henry and I have been researching the genealogy of the mysterious Cmdr. Churchill and discovered several interesting leads. It's a shame we didn't get to bring his hat to Mr Fogg's for Mr. Harper to illuminate upon - this little piece of history would've certainly stolen the show! Either way, it was a pleasant evening even with the extortionate bill at the end - £74 for sandwiches?! Welcome to Mayfair. If you are anything like me ie. a dedicated acquirer of anything older than yourself then these following recommendations are already on your radar (if anything you're probably wrinkling your nose going Pah, amateur! and flouncing off with your monocle bouncing about in a huff). But for the uninitiated and curious who wish to dip your toe into the dusty world of treasure-hunting, here are my Seven Places in London to Shop for Antiques, Vintage, Taxidermy, and the Downright Strange. While my window shopping of 'England's Prime Resource for Architectural Antiques, Salvage and Curiosities' is of the internet-browser variety (Command-N = window, get it?) there's no stopping Londoners from shopping at Lassco's Brunswick House venue; a Georgian mansion whose interiors, courtyards, and roof terraces groan with the most fabulous architectural salvage. With treasures like the 19th century Italian Carrera marble chimney piece and the 1760 George III giltwood mirror starting from 5-figure sums, Lassco is strictly on my 'sometime in the near future' lust list. Apart from the obvious (Bonham’s, Christies, Sotheby’s etc.) 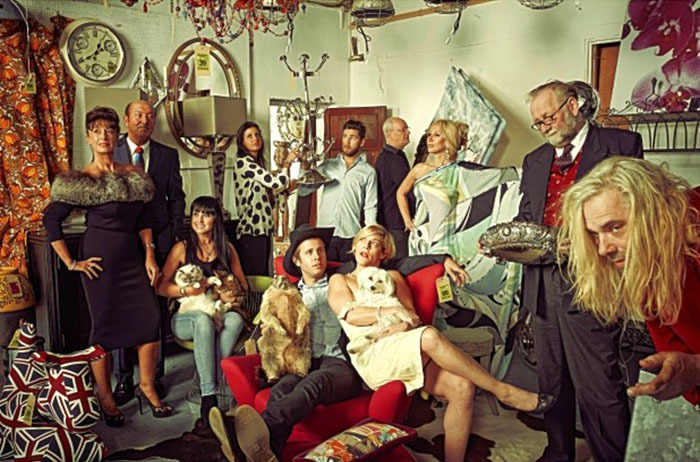 there’s Lots Road Auctions in Chelsea (pictured), Criterion Auctions in Wandsworth and Islington, Southgate Auction Rooms, and if you prefer to do your bidding from the comfort of your home there is Luckner’s, UK's first Internet auction house. 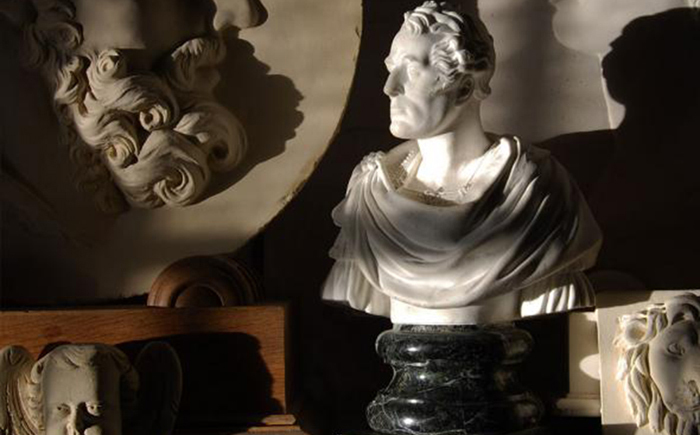 Auction days and times vary, as do the treasures you can find at your local auction house. I see some Phillipe Starck for Kartell ghost furniture up for grabs at Lots Road this Sunday, and today there is an auction at Southgate Auction Rooms - will I see you there? 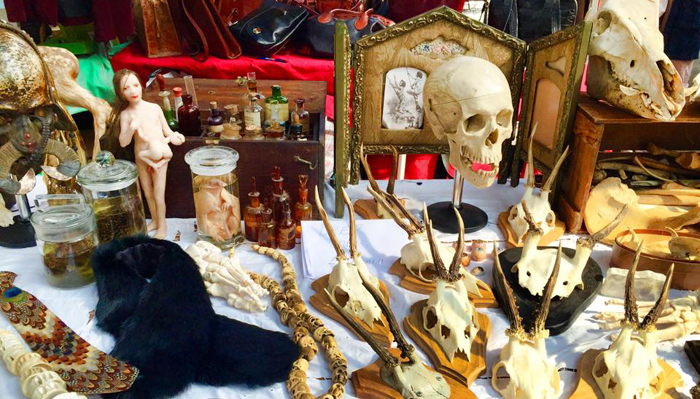 Hackney Flea Market is literally a jack of all trades. Independent creatives, up-and-coming designers, veteran sellers from established markets, locals clearing out their lofts all come together once a month to Abney Hall on Stoke Newington's Church St to sell an electric mix of taxidermy, handmade items, well-curated crap, antiques, vintage clothes, collectables etc. It's a real bric-a-brac of a market; with one-of-a-kind vintage-style sunglasses jostling for real estate beside French copper pan, stuffed deer heads, and minimalistic lightbulbs (how minimal? They're basically oversized vintage bulbs on a string). 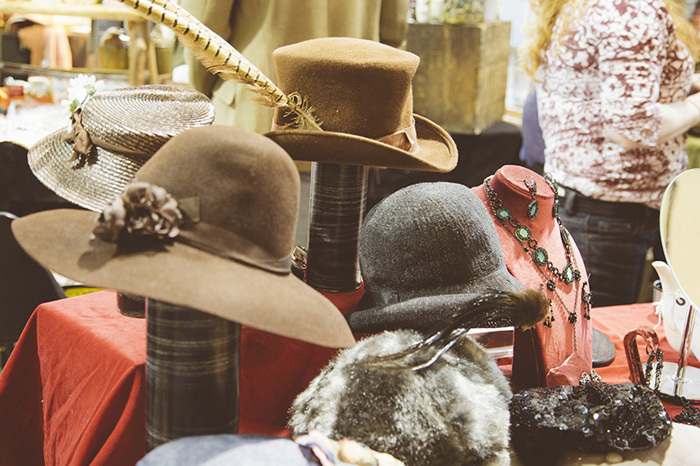 The next Hackney Flea Market event is this weekend, at Abney Hall. Ah, the good ol' Thursday market at Spitalfields, my local! There's no telling what you'll find at this Ali Baba's Cave - just open your eyes (and wallet), say 'open Sesame' and see for yourself the bric-and-brac begging for the taking. 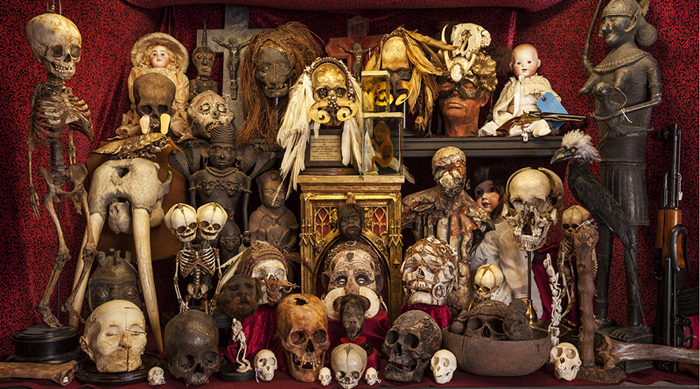 Medical curiosities, vintage and antique cameras, furniture, taxidermy, weapons, and art but to name a few. Thursdays at Old Spitalfields Market was my place to find deer skulls mounted on plagues, then I met Henry - and 'dead things on wood' comes with the territory. Seriously, I have a whole wall of skulls now. Definitely saving this post for when I start decorating houses! Always wanted to go to Mr Fogg's it looks really fun!! Sometimes the super extortionate bill is worth it - would you say Fogg's is one of those times? I've also never been to Mr Foggs...I seem to be missing out! I've never heard of any of these, and I live in London! Will definitely be checking some of them out because I love Vintage shopping!